These social media management and reporting tools are essential for tasks like scheduling, integrating with your blog, and responding to comments and messages in one place. Creating and publishing your social media posts takes far more time and creativity than the average person would expect, so when you have a management tool on your side, it becomes more efficient. We’re going to outline what to look for in an excellent social media management tool. After that, we’ll go through the pros and cons of our favorite social media management tools on the market. 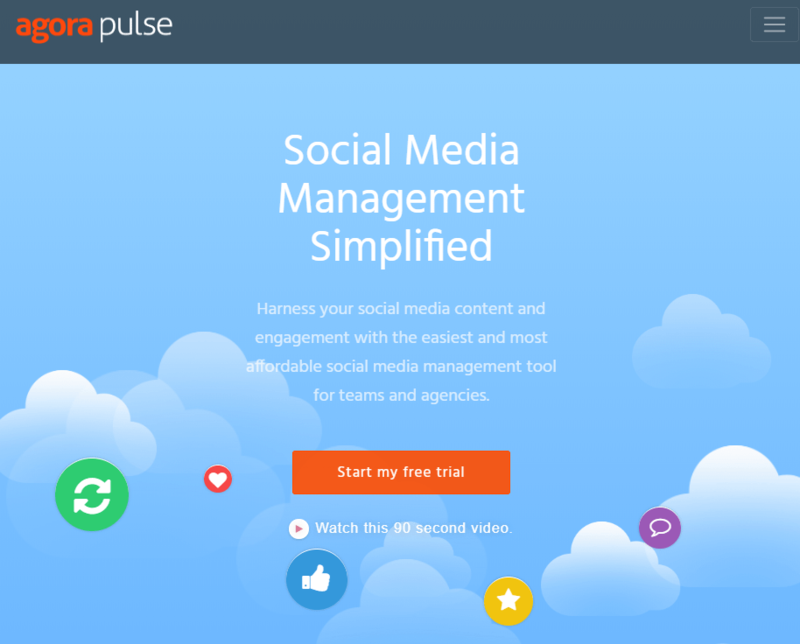 What should you look for when researching social media management tools? When attempting to figure out which social tool is right for you, you should break down exactly how you plan on using the tool. This involves understanding the size of your business, its customers, and how often you’d like to post. Each of the tools below has different functions, but the primary features are standard throughout the solutions. However, you’ll find that some of them focus on specific functions like advanced reporting, while others are made for all-around social management with scheduling, analytics, and market research features. An option to connect to a wide range of social networks such as Facebook, Instagram, and Twitter. Scheduling tools for planning your social strategy in advance. A team management module for interacting in larger teams. A social discovery feature to find interesting content to share. Analytics and monitoring to understand where social interactions come from and how well posts perform. Browser extensions for adding content to social feeds with the click of a button. Scheduled posts shouldn’t look too spammy or “manufactured”. As I mentioned, these features are only the primary tools to look for. As we go through the options below, you’ll realize that some of the social media management tools have extremely unique settings, making them perfect for certain individuals or organizations. Hootsuite is one of the most popular social media management tools. It provides a free plan for those getting started or with smaller companies. This way, you can work with three social profiles and send out 30 scheduled messages in the calendar. As a social management tool, it helps you save time by scheduling posts to multiple social accounts. You can also curate content from the internet and use the powerful analytics to show which of the posts are performing well in terms of ROI. Most companies will opt for the Professional Plan, which costs $29 per month and allows for 10 social profiles and unlimited scheduling. You can also expand this to additional social profiles and custom analytics for more money. Integrations with the six primary social networks, including Facebook, Twitter, and Instagram. You can also check out the app store to find more integrations. A module that helps you discover content and organize it within your social accounts. A direct connection to whatever cloud service you store your material in. Analytics with unlimited reports and social ROI tools. Monitoring options for seeing when your brand is mentioned. Team management, packed with user permissions, assignments, and more. A security system that alerts you when something looks wrong. All of your social networks fit into one dashboard. Hootsuite comes with an app store. Most of the apps are free and allow you to connect with popular CRMs (Cutomer Relationship Managers), email marketing tools, and eCommerce platforms. The interface does an excellent job of displaying different feeds side-by-side. There is a free plan for bloggers, freelancers, and smaller organizations. The auto-scheduler looks natural and non-spammy. The costs for Hootsuite have gradually gone up over the years. The Professional plan used to be cheaper. The $29 per month might be a little steep for some organizations. You don’t automatically receive all of the most advanced reports with the Professional Plan. So, this might end up being an additional expense. The interface will seem cluttered and confusing for some people. 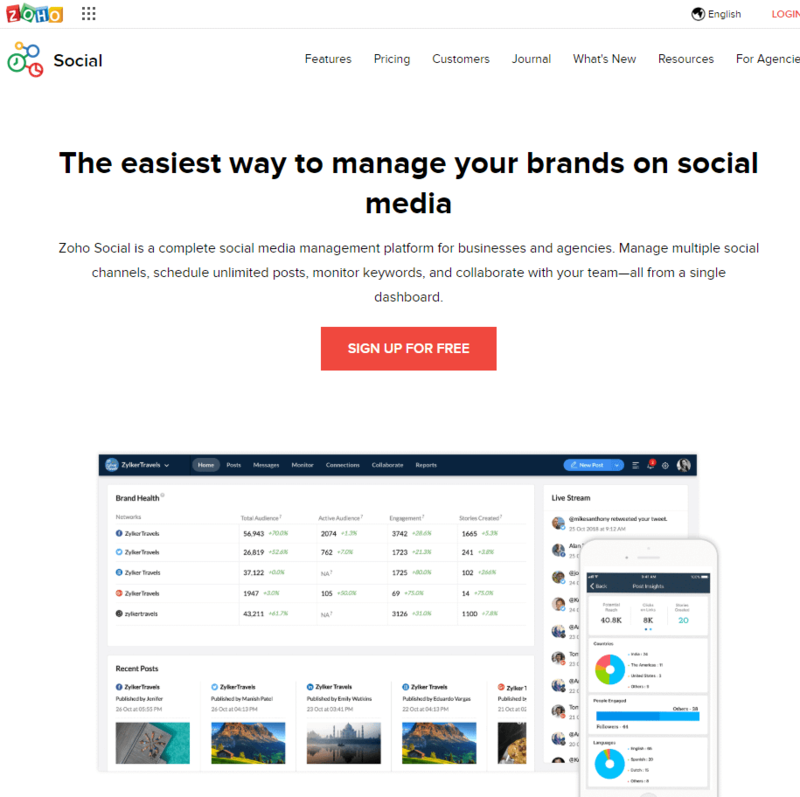 In the age of simplicity, you’ll see that other social media management tools on this list are better at cleaning up the interface. 👉 Who should consider this as one of their social media management tools? Any sized business that can fit it in the budget. We like it for those that want lots of features in one dashboard. It’s also great if you’d like many integrations and apps. The Buffer app has its fair share of fame in the social media world, mainly due to how streamlined it makes the publishing, replying, and analyzing of your social media posts. 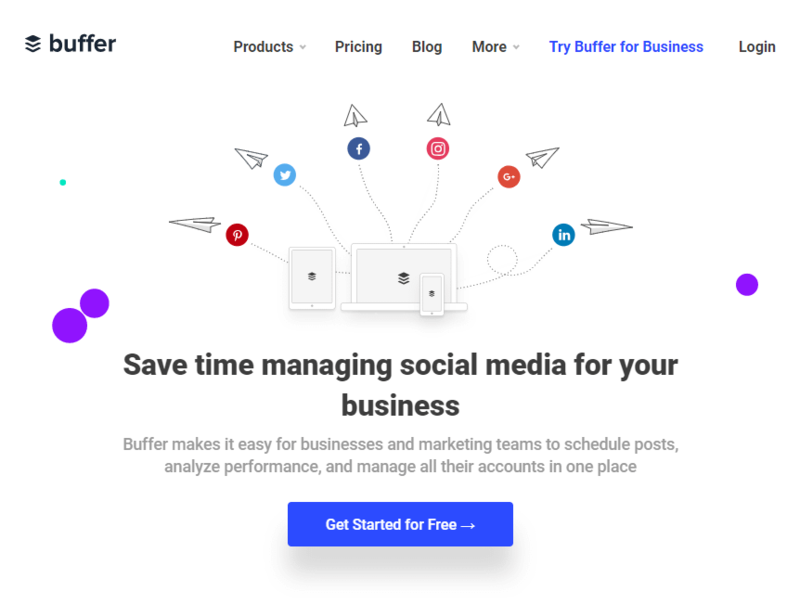 Along with an incredible blog and resource center, Buffer offers a completely free plan for up to three social accounts and 10 scheduled posts for each profile. The other option is a Pro Plan, which starts at $15 per month and goes up to hundreds of dollars per month depending on how big your company is. A sleek publishing and scheduling platform for managing all accounts in one place. Support for several team members with varied user access. Options to connect with the most popular social networks, such as Pinterest, Facebook, and Instagram. An optional module called Buffer Reply for managing all social media replies in one inbox. An optional tool called Buffer Analyze for enhancing your metrics and reports. Buffer has a free account and an affordable Pro plan. The browser extension makes for a seamless process when browsing and scheduling content. It’s about as automated as you can get, with some tools for fine-tuning your posts before they go out. The interface is easy to grasp. Some popular networks, like Pinterest, aren’t included in the free plan. There is a huge price jump from Pro to the Business plans. 👉 Who should consider this as one of their social media management tools? If the social networks you use are in the free plan (and you don’t need to post that much) the free plan is amazing. Really, any business size could use Buffer and probably get away with the $15 per month Pro plan. The problem arises when you need to upgrade to a pricey Business plan. Social Pilot is known for connecting you with just about every social network you can think of. It provides simple scheduling, team collaboration tools, and a content curator. The analytics are also quite impressive, with white label PDF reports for sending out to clients or stakeholders. Although Social Pilot calls itself a cost-effective social scheduling solution, that might be a stretch. It doesn’t have a free plan, and the Professional plan starts at $30 per month. The good news is that it supports 50 social accounts, so you are getting more bang for your buck. Integrations with dozens of social networks. Some of the plans support about 200 accounts. You can send out hundreds of posts each day, making it ideal for agencies. The analytics include white-label PDF printouts. A social inbox for managing all replies in one place. You can have multiple team members. It also has a browser extension and URL shortener. It’s hard to argue against the value that Social Pilot provides. It connects you with far more networks than other tools, and you most likely won’t hit the publishing limits. Content curation and RSS integrations help out with automated content delivery. 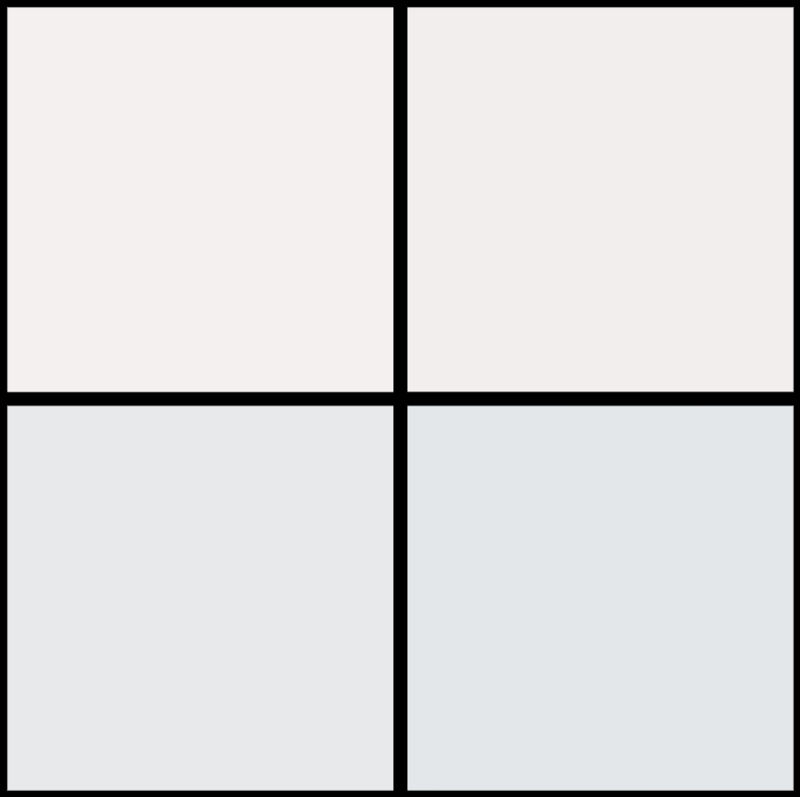 The white-label PDF reports are great for agencies. The client management is excellent for putting your clients into groups. I’ve found that publishing on some of the social networks is more cumbersome than others. For instance, Instagram takes much longer than others. The cost may be a bit high for companies that need something more minimal. The scheduling interface is less intuitive than the competition. 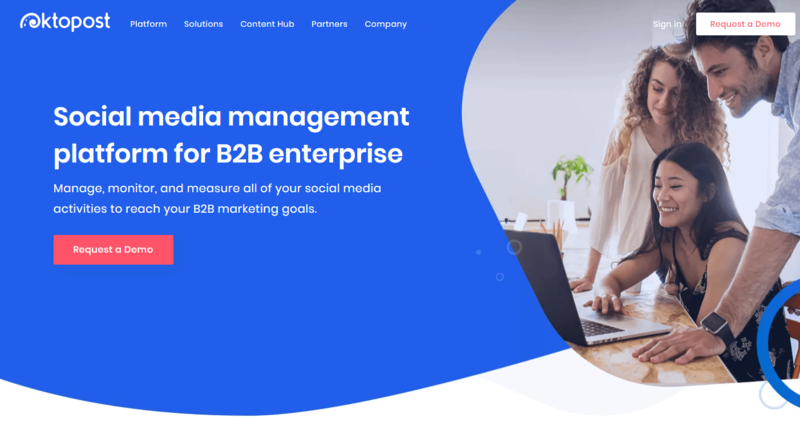 👉 Who should consider this as one of their social media management tools? 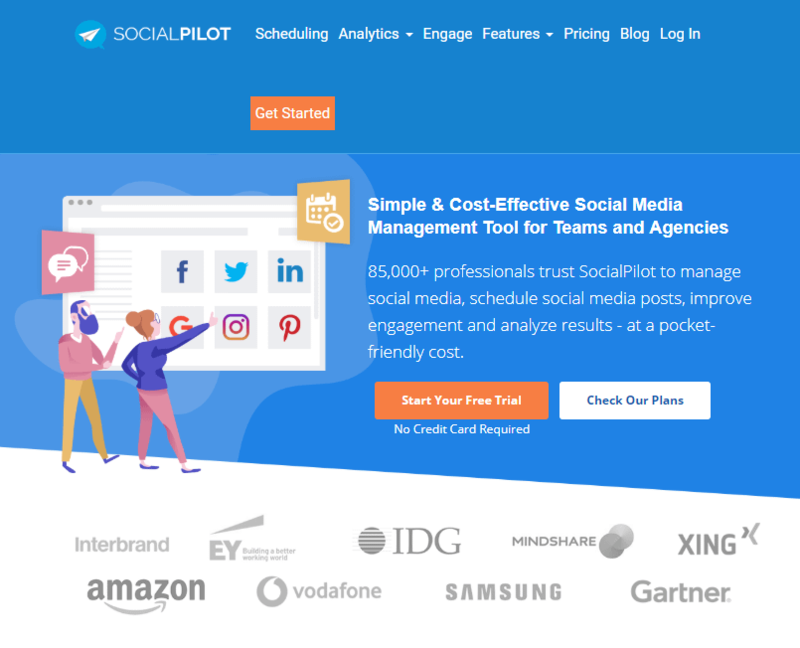 Social Pilot makes the most sense for companies with lots of clients since it doesn’t limit you much on social network connections or posts per day. Sprout Social has a focus on building and fostering more human relationships with followers on social media. It’s definitely built for more established businesses, since it does a great job of linking companies with brand advocates. Not only that, but the pricing starts at $99 per user per month. A social inbox for handling all comments, replies, and messages. Integrations with up to ten social profiles. 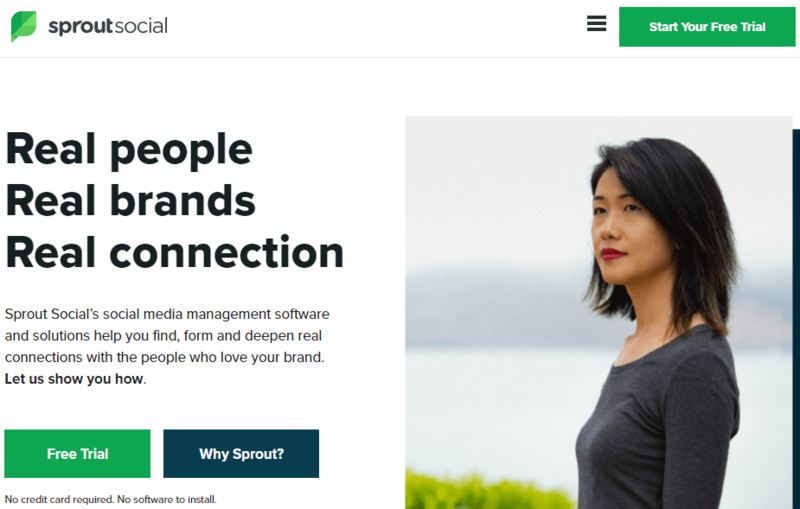 Sprout Social has a full social media management system, with tools for analytics, engagement, publishing, and uncovering trends. The interface is cleaner and more intuitive than more popular options like Hootsuite and Buffer. Every aspect of your social media management is handled inside Sprout Social. There’s an asset library for storing your own photos. The messaging is seamless and it links to numerous social networks. The pricing is far too expensive for smaller organizations or self-employed people. You’re limited to five social profiles in the primary plan. The most you can have is ten. Some of the reports aren’t as good as the competition. 👉 Who should consider this as one of their social media management tools? Sprout Social looks like a steal for mid-sized to large businesses that are ready to partner with brand advocates. The MavSocial tool offers a modern, streamlined interface for curating and scheduling your posts. It’s one of the easiest dashboards to use, and it focuses on the most important parts of social sharing: scheduling, messaging followers, and understanding what others are posting. The pricing is reasonable, including a free plan for two social profiles. The Advanced version starts at $16 per month for one user. A beautiful campaign calendar combined with a planner. MavSocial has a mobile app that works really well. Repeat publishing and a social inbox. You receive a large selection of features for the price tag. Even the Advanced plan has a low price. MavSocial offers one of the simplest, cleanest interfaces on the market. The metrics and reports are passable, but they don’t compare in the quantity or quality of other management tools. Team management is not a feature until the $166 per month plan. 👉 Who should consider this as one of their social media management tools? MavSocial caters to those who want the essentials of social media management. The pricing plans are flexible, so anyone can use it, from a freelancer to a large corporation. 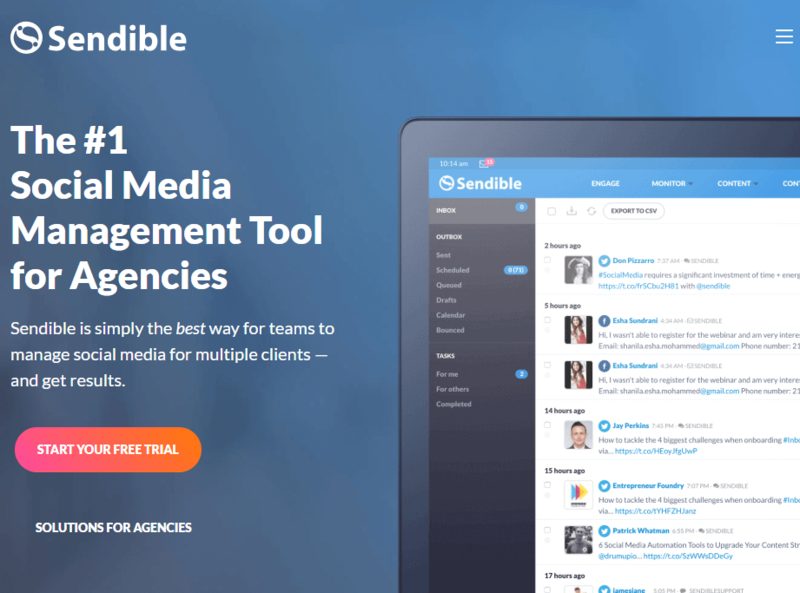 Sendible is marketed directly to social media agencies. It caters to companies that have teams of people. That said, Sendible manages to keep prices fairly low, with the Micro plan starting at $29 per month (12 services and one user). Support for hundreds of social networks. Delegation and communication tools, all in one dashboard. Social reports with emails and printouts. Agencies aren’t required to spend hundreds of dollars to support many clients. The collaboration and client communication tools are top-notch. The customer service is known to be extremely helpful. Every aspect of social media management is covered, from scheduling to analyzing. The interface can get confusing and cluttered when you have too many services connected. Some of the plans may be too expensive for some companies. There isn’t a free plan for smaller agencies or individuals. 👉 Who should consider this as one of their social media management tools? There’s no doubt about it. Sendible is best for agencies. The Zoho Social product, like everything from Zoho, is modern, extremely simple, and far less expensive than any competition. Zoho Social has a free edition for one team member, and you can publish on all networks. After that, the Standard plan costs $10 per month. 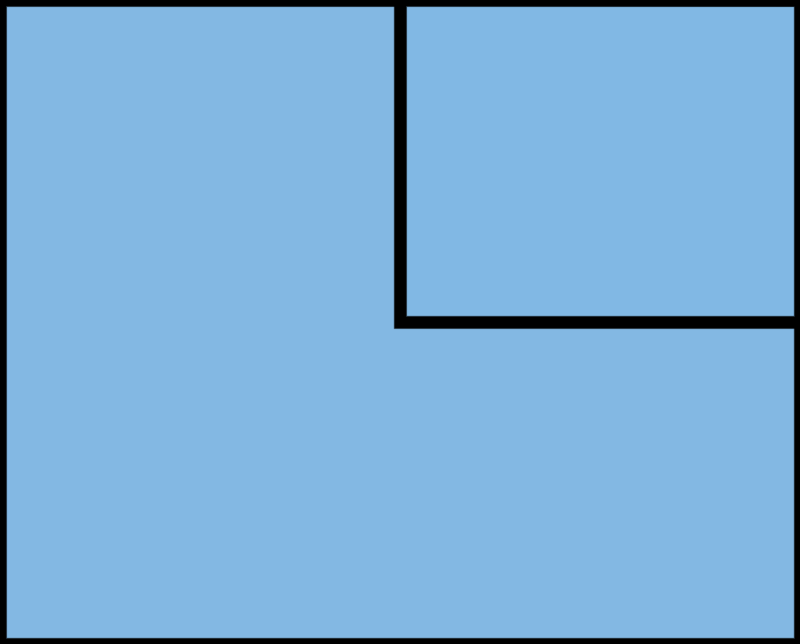 Post content immediately or schedule on a calendar. There’s a bulk scheduler with a URL shortener. The zShare plugin grabs articles online and instantly shares them. Communicate with your team on all social posts. View reports and brand mentions. Reply to all social network messages in one inbox. Several integrations such as Facebook Lead Ads and Zoho CRM. The scheduling works seemlessly with the most popular social accounts. You can send data from Zoho Social directly to your CRM. It has one of the easiest to understand interfaces on the market. The SmartQ and zShare tools help with automation. A free plan is offered, and the other plans are affordable. The feature-set is limiting for larger agencies and enterprises. Don’t expect the most powerful analytics and reports. 👉 Who should consider this as one of their social media management tools? The pricing and simplicity makes Zoho Social great for individuals and small to medium-sized businesses. Oktopost is built specifically for B2B companies, allowing for the combination of three social media elements. 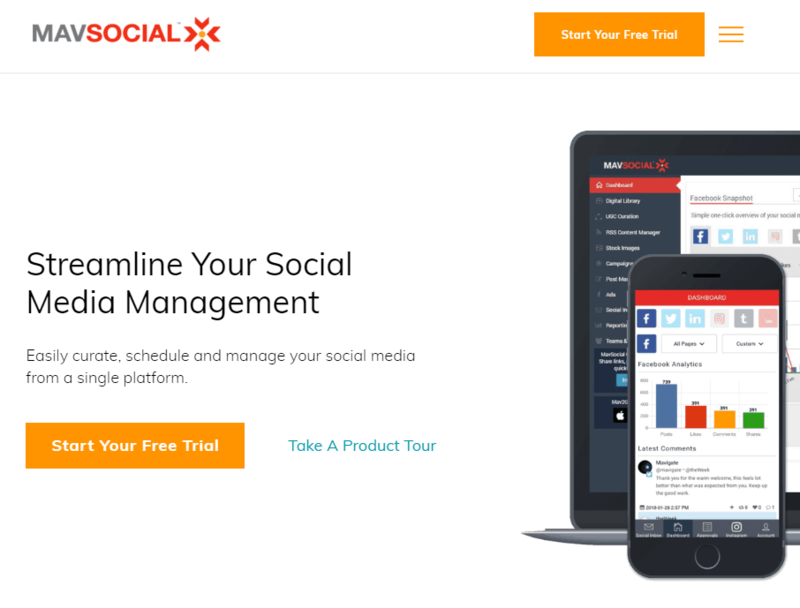 The first is social management, with scheduling and content curation. The second is social employee advocacy. And the third is social media promotions. You’ll have to request a demo for pricing. Your pricing could be as low as a few hundred per month and could go up to thousands per month. It all depends on how many employees use the software, along with the number of social profiles and social advocates. Social publishing with intelligent curation and scheduling. Team collaboration and a unified inbox. Advanced monitoring and lead generation tracking. An employee leaderboard to encourage advocacy participation. User permissions and crisis management options. It’s truly a software meant to help with B2B social strategies. It incorporates gamification to encourage employees to interact with people on social channels. The analytics and ROI tools are some of the best in the business. Customization for unique business needs isn’t always available. Pricing isn’t listed on the website, so you’ll have to work with a salesperson during a demo. 👉 Who should consider this as one of their social media management tools? We like Oktopost for most B2B companies, but we encourage you to go through a demo to see if the interface and pricing is right. AgoraPulse takes the tools you would typically find with expensive agency software and makes them more affordable and clean. The pricing starts at $39 per month for three social profiles and one user. This isn’t rock-bottom pricing, but it’s nice to know that all features are included with this price. An unlimited number of scheduled posts. One inbox for all social messages. Social media listening for curation. The pricing is solid for how many features you receive. The onboarding process is quick. AgoraPulse has automated social posting that works better than the competition. Some of the reports have limited information. Some reports require a certain number of followers to generate data. 👉 Who should consider this as one of their social media management tools? AgoraPulse looks good for smaller agencies and those who like an extremely clean interface. IFTTT is not so much a social media management suite, but rather a way to integrate a collection of your current social tools. For instance, you may want to automatically share new YouTube videos to Facebook. 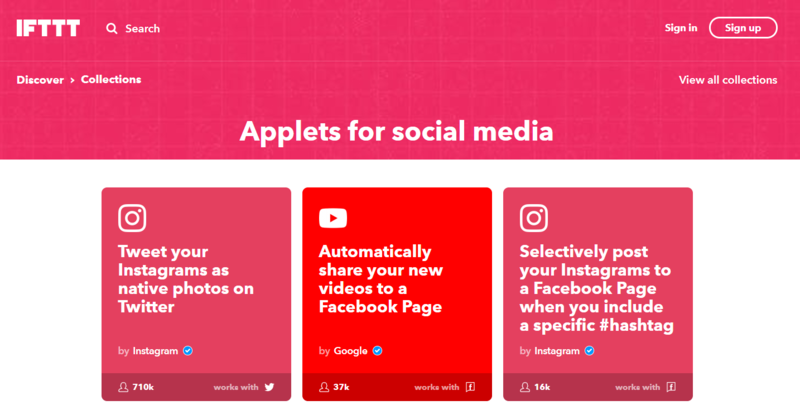 IFTTT is free to use, and it has a wide range of social applets for complementing other social or small business tools you’re currently using. Connect hundreds of business tools together in one app. You receive far more besides social integrations. Search through the large collection of social applets to see which ones work for you. Consider making your own for the ultimate customization. You can make your own integrations. The social tools are quite powerful. There are plenty of other applets for things outside of social media. This isn’t going to provide one inbox for you to manage all social messages. IFTTT can get confusing if you start configuring dozens of integrations. 👉 Who should consider this as one of their social media management tools? We recommend that all businesses at least test out IFTTT to see how it can complement a social strategy. 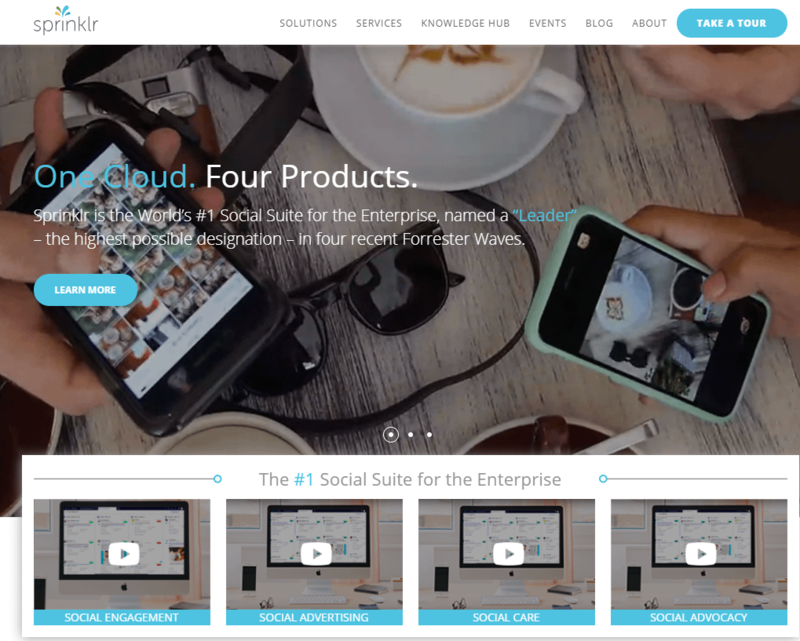 Sprinklr helps enterprises promote social engagement, advertising, customer care, and advocacy. Some of the biggerest companies in the world use Sprinklr. A demo is required to get your custom pricing. Content and advocacy marketing, all powered through the cloud. Paid media ads and reports. Insights for locations, benchmarking, and products. Social listening, publishing, and engagement. Social media posting, scheduling, and curation is all handled in real-time. Sprinklr provides every social feature a larger business would need. It does a wonderful job of managing social messages in one place for a large customer support team. Sprinklr is an extremely robust program that’s bound to intitimidate some users. There’s not a budget-friendly version. Extensive training is required for most users. 👉 Who should consider this as one of their social media management tools? Sprinklr is meant for large enterprises. As you may have noticed from your own research, the internet is littered with social media management tools. Hopefully, this helps you narrow down your search a bit! If you have any questions, let us know in the comments.